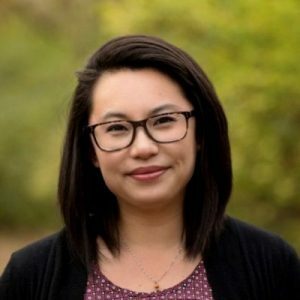 Mihee Kim-Kort is an ordained Presbyterian (PCUSA) minister with degrees in divinity and theology from Princeton Theological Seminary and English Literature and Religious Studies from the University of Colorado in beautiful Boulder. She is a PhD student in Religious Studies at Indiana University. Currently, she juggles various jobs including being a wife to another Presbyterian minister, raising three children, itinerant preaching and speaking, writing, hanging out with young people, struggling with being an Enneagram 7, rabble-rousing in Bloomington, and liking too many posts on Facebook and admiring people on Twitter and Instagram. Born in Seoul, Korea, she and her parents immigrated here shortly after her birth. Settling in Colorado, she was baptized in a Methodist church before her family joined the local Korean Presbyterian (PCUSA) church. It was here that she learned the faith from an African American, who was a respected Elder and teacher in the church, and from a little old lady that was the wife of the former pastor of the white Presbyterian congregation that shared the building with the church. She loves all things Church, and believes in what God is doing in and through it, even despite the huge failings and egos that plague the human institution. God’s spirit has always moved and been present on the margins, on the fringes, on the edges, and she is doing everything she can to see it and help others to feel it, too. Mihee’s books and other publications can be found here.